Majaz, based on the life of Asraul Haq Majaz, the John Keats of Urdu poetry, marks Talat Aziz's debut as a composer in Hindi cinema. The film could have been an excellent biopic had it stuck to the poet's poetic self rather than his unfulfilled love, says Mohammad Asim Siddiqui. A poster for the film Majaz. Asrarul Haq Majaz (1911 to 1955) is often described as the John Keats of Urdu poetry, maybe because of his worship of beauty, his tragic life and his premature death. His addiction to wine, his failure in love, his inability to fulfill the requirements of government jobs, his nervous breakdowns have all become part of Urdu folklore. 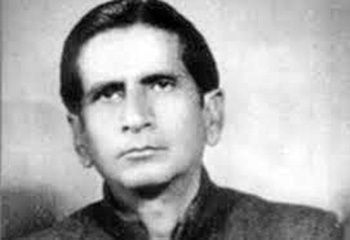 His poetry, though, has survived the test of time and he is today rated as one of the most talented Urdu poets. Paying a tribute to his poetry and offering a peep into his complex personality is the film, Majaz: Ay Gham-e-Dil Kya Karu, directed by Ravindra Singh. The lead role of Majaz, competently played by Priyanshu Chatterjee, brings the pain and suffering in Majaz's life and the beautiful songs in the film bring alive the world of Urdu poetry. Majaz's life becomes a metaphor to understand the struggle of a romantic-poetic self in the world of hard economics and power relations. Didn't Oscar Wilde write: 'Romance is the privilege of the rich, not the profession of the unemployed? The poor should be practical and prosaic'? The impractical and poetic Majaz, left, meets failure after failure in his love and career and finds refuge in wine and poetry. Devdas follows him, Majaz yields. Majaz has been advertised as a biopic. Any biopic can be made interesting if it brings out the social or psychological self of the subject. Majaz tries to be a bit too ambitious and falters at places because of its unimaginative direction and patchy editing. Perhaps it could have been an excellent biopic had it stuck to the poet's poetic self rather than his unfulfilled love. Isn't the subject of unfulfilled love too clichéd to offer anything new in Majaz's life? The weight of Muslim socials of the 1960s also sits heavy on the film. Majaz's struggle between being a dutiful son from a feudal family and a romantic poet who has elements of rebellion in him makes the canvas of the film very large. There is a Mere Mehboob moment in the film when its burqa-clad heroine, a student of Aligarh Muslim University, bumps into our poet and drops her books. The character of a funny poet impersonating Majaz and winning accolades also had its prototype in Binda Din 'Ghayal,' played by Johnny Walker in Mere Mehboob. An alternation of setting between Lucknow and Aligarh, with their old buildings and green parks, also gives a nod to Mere Mehboob. But Majaz is also a period film, so the costumes, manners and values shown in the film recall a decadant feudal culture which, if it had its drawbacks, also had its own attraction. The colourful gharara, which today is associated with festive occasions, was then worn by ladies routinely. When the boss wanted to summon an employee, he had to send him a 'salaam' through an attendant, but the employee had to immediately report to him. How a simple salaam has different meanings in different contexts! Majaz's stern father, played by Madihur Rahman, is the first person in the family of landowners to take up a government job and knows that his son must do engineering rather than pursue the muse. 'Hitler Qureshi' of Three Idiots in another age and time? There are brief appearances by other contemporary poets, but the political context remains unexplored in the film. The character of Josh Malihabadi, a very important name in Urdu poetry, is underutilised. Another contemporary poet Fani (authentically played by F S Sheerani), who passed useful tips to a young Majaz, offers a glimpse into the ustad-shaagird (mentor-mentee) relationship in Urdu literary culture. In a cameo performance, Mohammad Ali Shah talks about the need for revolution in Urdu poetry and to turn the focus of Urdu poetry away from love, beloved, wine and the feudal culture. Shah winks at the Progressive Writers Movement which had its strongest voice in Urdu literature. Majaz's strength is its music and poetry. It recreates a world where the poetic word was losing out to hard economic realities. But even in losing out, poetry survives. More than a biopic, the film works well as a musical romance. A biopic requires a very tight script. A musical romance can thrive on the strength of its music. There are any number of Hindi films which are forgotten except for their songs. Majaz has Talat Aziz's soulful, lilting, music which transport you to a different world. The film marks Talat Aziz's debut as a composer in Hindi cinema. It has some beautiful lyrics from Majaz's collection Aahang (available in English translation by Sami Rafiq), sung by Talat Aziz. It also has an excellent Sufi song Allah O Ghani sung by Sonu Nigam. Years ago, Ghalib's immortal poetry was popularised by Jagjit Singh in Gulzar's eminently watchable television serial Mirza Ghalib. That Naseeruddin Shah played Ghalib in the serial further enhanced the reach of Ghalib's poetry. Majaz does not have its Naseeruddin Shah, but Majaz's beautiful creations Ae Gham E Dil Kya Karu, Ae Wahshat E Dil Kya Karu, Husn Ko Behijab Hona Tha and many others so far appreciated only by his Urdu readers can now have a wider audience, thanks to Talat Aziz's brilliance and hard work. Majaz's famous creation Nazr E Aligarh is now better known as the Aligarh Muslim University's tarana (song). It is usually sung as a chorus. It required Talat Aziz's genius to present it as a solo number and not suffer in comparison. Mohammad Asim Siddiqui teaches English at Aligarh Muslim University.